Sarah Jane White, with her grandson, worries that someday, children won’t be able to find clean water on the Navajo reservation. Sarah Jane White’s walking to the top of a sandy hill near the eastern edge of the Navajo reservation. Along the way, she points to footprints in the sand. Her 4-year-old grandson, Albino, crouches to look. She shows him the prints of a horse, then a cow. Each time, he’s delighted. It’s sunny and warm, though just a few days before the official start of winter. We walk past juniper trees, an old sweat lodge. Albino powers across the sandstone arroyo and on up the hill. The sky’s a deep blue. And depending on the breeze, the air smells like either sage or pine. White and her relatives are “allottees,” Navajo people living on lands deeded to them by the federal government. The federal government deferred new oil leases near Chaco Canyon National Historical Park last month. But many people who live here are still worried about how development outside the park will affect their communities, their landscapes, and their children’s futures. If you’ve driven Highway 550 between Cuba and Farmington recently, you’ve seen the oil rigs and flares on federal allotments along the road near Lybrook and Counselor. In the past two years, the U.S. Bureau of Land Management has approved more than 100 new exploratory wells around here. Companies like Encana Corporation and WPX Energy have come in, offering tens of thousands of dollars to allottees willing to have a well on their lands. Each well pad has its own road, waste pond, and tanks. During drilling, pickup trucks and semi-trucks run up and down the roads 24 hours a day. Oftentimes, she explains, people don’t understand what they’re signing, and they don’t understand what’s going to happen on their lands. That’s also a one-time payment – even if the well runs for decades. Many Navajo people who live here are upset that the roads leading to their homes are being ripped up by semi-trucks. They’re afraid of fracking fluids. They don’t know what’s coming out of the flares. And they worry about blowouts and accidents that happen far – very far – from emergency services. Guttierrez knows that the wells mean money: lots of cash for people working in the fields, and depending on land ownership and jurisdiction, hundreds of millions of dollars for the state of New Mexico, the federal government, or the Navajo Nation tribal government and millions more in profits for the oil companies. But she’s angry that Navajo people are living with the trucks and the flares, the noise and the fear. That’s why they are fighting, she says. Because what happens now will still matter to the children born here in a century. 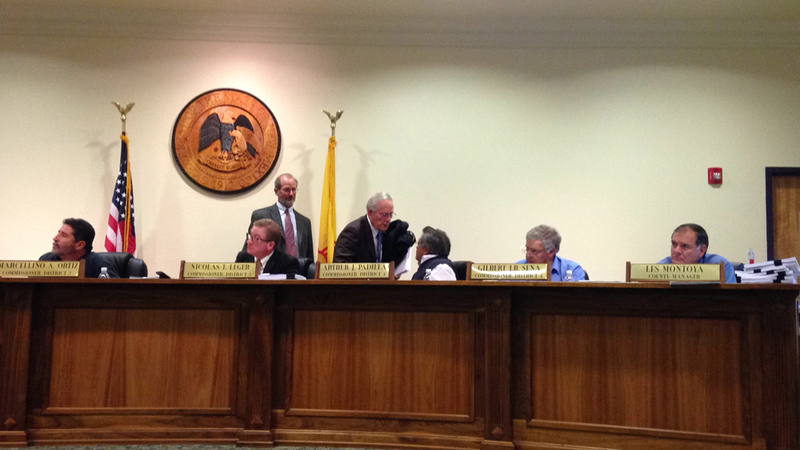 San Miguel County Passes Tough Oil and Gas Regulations. Today the San Miguel County Commission unanimously voted to adopt the San Miguel County Oil and Gas Regulations ordinance, which uses zoning and stringent requirements to regulate how and where the oil and gas industry can explore, drill, and hydraulically “frack” within the county. At the last public hearing before the adoption of the ordinance, Robert Freilich, the land use law attorney who helped the county draft the ordinance, stated, “This ordinance is a lot better than Santa Fe’s ordinance.” He also acknowledged the hard work of the members of PROTECT San Miguel County, whose diligence in reviewing the ordinance and helping in its revision makes it one of the toughest in the country. After the commissioners passed the ordinance, they also thanked all of those who had worked so hard to make this a reality. Permit application processes and studies are extensive, including detailed environmental impacts, water availability, traffic, infrastructure, geohydrology, fiscal impacts and emergency response plans. Regulations for enforcement now include the hiring of a well-qualified county inspector, paid for by the industry, who will be responsible for overall application review as well as frequent monitoring and inspections stipulated in the ordinance. The strong post-permit monitoring now includes a 10-year annual inspection of abandoned wells for possible leakage. The industry is held responsible for all County costs, including application technical review, ongoing inspection and monitoring, and additional off-site infrastructure (roads, judicial system, etc.). Protection and mitigation requirements have been expanded to cover all areas of potential impacts by the drilling process (surface water, groundwater, air, noise, lighting, traffic, viewshed, etc.). These regulatory requirements will apply to the eastern portion of the county—the boundary line is about 30 miles east of I-25 and runs from north to south— where exploration and drilling will be allowed. The western portion of the county is off limits. Pre-operation baseline testing requirements for air quality and water quality are extensive. Air quality monitoring has been strengthened to protect county citizens from potential leaks of gasses during operations (drilling, fracking, and extraction). Closed loop systems are required. Open pit storage of fluids is prohibited. Disposal of all wastes must be at state approved waste facilities, of which there are none within the county. Water quality requirements were strengthened by designating which substances the industry has to test for. Set back limits from drilling operations were established for a wide arrange of categories. Residential and school set backs are 4,000 feet, approximately a kilometer; non-residential structures are 1,000 feet; and groundwater recharge areas such as wetlands, acequias, and rivers are 1.5 miles. Conchas Lake, a popular recreation area, has a 2-mile set back. I asked Wessely if he felt this ordinance would act to discourage oil and gas development because of its onerous requirements. He answered that it would certainly discourage a “fly by night” operator and would make large companies like Shell carefully consider whether it’s worthwhile, before engaging in the process. While there is currently no drilling taking place in the county, there are leases in the Watrous area (west of the dividing line) and some ranchers in the eastern area are desirous of having drilling on their ranches. The San Miguel Oil and Gas Regulations were long in the making. La Jicarita asked Pat Leahan, with the Las Vegas Peace and Justice Center and PROTECT San Miguel County, to provide a timeline of how the public and county worked together to promulgate this ordinance. In 2008 the Las Vegas Peace and Justice Center was asked by some folks in Mora County to look into leases that were being requested in Mora County, which prompted the Center to see if there were any leases also being pursued in San Miguel County. In October of 2009 the Center went before the San Miguel County Commission to present the information that there had been drilling activity in 2006. The county was unaware of that fact and when it looked into county regulations involving extraction found that the regulations dealt primarily with gravel and other types of mining, not oil and gas. San Miguel County Attorney Jesus Lopez directed the commission to look into drafting a moratorium on oil and gas drilling to give the county time to look into the issue. At the November 10, 2009 county commission meeting the Peace and Justice Center presented documentation on the well that was drilled in 2006—location map, permit application, capping, etc.—and the Las Vegas Basin White Paper, a report that was commissioned by the group Drilling Santa Fe to analyze the impacts of potential drilling and fracturing in the Basin. The Center also presented this information to the mayor of Las Vegas who imposed a moratorium within the city limits. On December 8, 2009, the County Commission adopted Resolution 12- 08-09-NATURAL RESOURCES, proposing the adoption of a one-year moratorium on conditional use permits for oil, gas or geothermal exploration, extraction, or drilling. A moratorium was passed on January 10, 2010. In early 2010, after a screening of the film “Split Estate” a small group of people (Bob Wessely, Leslie Hammel-Turk, Brad Turk, Barbara Ehrlich, Kim Kirkpatrick, Carole Silon, Pat Leahan, Kate Daniel, Don Shaw, and Arielle Hawney) organized PROTECT San Miguel County to educate themselves and strategize on the issue of oil and gas development. The Las Vegas Peace and Justice Center retained the New Mexico Environmental Law Center as a consultant to help draft an oil and gas ordinance. After consulting with Drilling Santa Fe it learned of Robert Freilich, the land use attorney who helped draft the Santa Fe County Ordinance. Freilich was subsequently hired by the county to help draft the San Miguel ordinance. PROTECT San Miguel County sponsored and participated in many community forums and talks on Community Peace Radio to educate the public. A San Miguel County Oil and Gas Ordinance Task Force had been established and members of PROTECT joined the task force. The task force proved largely ineffective because of obstructionist tactics by the New Mexico Independent Petroleum Association representative. The moratorium on oil and gas development was renewed several times for a total of four years. While folks in San Miguel County are celebrating the passage of these regulations, neighboring Mora County is navigating tough legal terrain. In 2013 Mora County passed an outright ban on oil and gas development and is now embroiled in two industry lawsuits. Last week, U.S. District Judge Browning heard arguments on a motion for summary judgment in the SWEPI LP (a subsidiary of Royal Dutch Shell) vs. Mora County lawsuit. Based on his statements in the courtroom—“Some of these provisions are pretty wild; they’re pretty inconsistent with centuries of federal law” —it seems likely that at a subsequent hearing he will rule that either some of the language in the Mora County Community Water Rights and Local Self-Government Ordinance is unconstitutional or that the entire ordinance should be thrown out. Another lawsuit filed against Mora County by private landholders and the Independent Petroleum Association remains extant but settlement negotiations are ongoing. It is now just 2 months until the October 11 Global Frackdown. With over 150 organizations already signed up as partners, the third Global Frackdown looks to be a powerful day of action. Already partners are signed up from Argentina, Australia, Canada, Czech Republic, France, Germany, India, Ireland, Italy, Lithuania, Mexico, Netherlands, New Zealand, Romania, South Africa, Spain, Tunisia, United Kingdom, and all across the United States. These are challenging times for our climate and with the political situation in many of our countries on energy issues. The Global Frackdown – coming on the heals of the big climate march in New York (September 21) – will provide a forum for us to collectively push back against big oil and gas, call for a ban on fracking, and demand our government officials to push for a renewable energy future. Please contact me with any questions! Thanks. Please share this with your networks and on listservs to help spread the word. Please sign up to take action on our website. I hope this finds you well, willing and able to circulate these materials in time for the BLM deadline of Friday the 15th. If you have contacts among other organizations to whom you can pass this on, it could be very important as our outreach is woeful. I am sending 4 documents which may or may not all be useful to you: 1) BLM specifications for an acceptable letter of protest; 2) a synopsis of the arguments against fracking in this watershed through which passes the majority of the entire water supply for the state of New Mexico; 3) Talking Points to pick and choose from when writing a letter so that each is unique and not disqualified; 4) a sample letter. The BLM Farmington Field Office is in the process of selling leases for 13 parcels of public land in the Santa Fe National Forest to oil and gas companies that may pollute our land, air and water. To allow this would endanger the Rio Chama Watershed and the Rio Grande with which it is joined. We need to protect the New Mexico’s primary watershed and this is our chance. The time is now! Please write your official letter of protest to stop the BLM from proceeding. The protest must include your name RETURN ADDRESS. BLM must reply. You must sign your protest as an individual citizen, not as an organization, unless fully ratified. 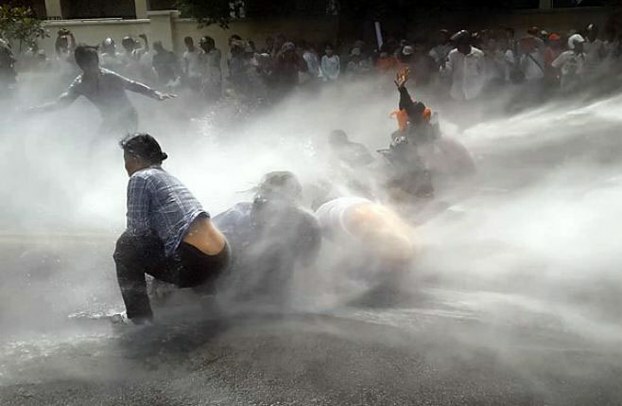 A protest must state the INTEREST of the protesting party in matter. E.g. I am a resident/rancher/land owner/hiker/visitor/acequiero. The protest must include REASONS to support the protest. BLM will dismiss a protest filed without a statement of reasons. Use the talking points to help build your statement of reasons. The most important is the danger to the scant and precious supply of water in New Mexico. Procedurally, pointing out that the BLM’s has NOT fulfilled its responsibility to verify that studies conducted truly substantiate a “finding of no significant impact” (FONSI), is the most important objection we can make. Furthermore, we believe it’s impossible because you cannot fracture shale above the aquifer without contamination. BLM must receive a protest no later than close of business on August 15, 2014. As they said in school, USE YOUR OWN WORDS .The BLM disallows form letters. No email will be accepted. Hydraulic fracturing, “fracking”, uses millions and millions of gallons of water for each well, every time it is fracked. if the BLM sells leases to oil and gas companies, they will use water necessary for the life of all communities downstream. Water is far more valuable to us than oil and gas because el agua ES la vida. New Mexico has never had water to spare, especially now that the monsoon doesn’t deliver as it used to and because we are in drought. 50 to 60% of all of New Mexico’s water passes through the eastern side of Rio Arriba as surface and ground water and all of it is at risk because of the danger of contamination. In 2009, the County Commission attempted to protect the eastern side of the Continental Divide where the headwaters of the Rio Chama form by delineating a frontier district protected from oil and gas exploitation and the ordinance should be respected. The lands proposed for lease sale by the BLM in the Santa Fe National Forest around Regina, are on the eastern side of the Continental Divide, among the tributaries of the Rio Chama. They are beautiful and precious places in themselves – the Rio Galllina, the wetland areas of Parcel 12, archaeological sites and more. 37,000 oil and gas wells are operating in the San Juan Basin around Farmington, with many more planned – providing a lot of oil and gas and a lot of revenue for government. It makes sense to restrict oil and gas production to areas of basin west of the Continental Divide that cannot contaminate widely downstream. The process of extraction uses hundreds of chemicals in formulas that are trade secrets. Although the oil and gas industry claims they are safe, the national House of Representatives made a study identifying 2500 chemicals used of which 650 are known to cause cancer. The wells proposed around Regina will be drilled in shallow shale, using a new technology of horizontal drilling which has not been adequately tested and studied. Because the shale layer sits on top of the Morrison Formation holding our aquifer which is recharged by rain and snowmelt trickling through the shale, there is no way to protect water in the aquifer from chemicals injected under pressure sufficient to break shale during this process. Wells drilled into Morrison Foundation, such as the community well in Cebolla, have been tested and proven to provide some of the best water in the state. Fracking has been linked to earthquakes in many places that have never experienced them before. The Abiquiu Dam and other sites sit atop fault lines and are already vulnerable. Gas is a often merely a byproduct of fracking, not worth capturing for sale, though it may measure in the hundreds of millions of gallons, as in Oklahoma. It will be released into our air, or burned off by “flaring” – like lighting a giant blowtorch – in the midst of a region where catastrophic fires have raged in recent years. Such large volumes of gas are flared off from the main shale fields that they are visible from space. This past winter a well exploded in Pennsylvania so it can happen again. Storage tanks release volatile chemicals constantly in an invisible smoke which can be revealed by infrared film and none of it is healthy. The industry claims that you can drink fracking fluid but 17 cows in Pennsylvania died after an hour’s exposure. The closer you live to a fracking operation the greater your chances of developing chronic rashes, headaches, nosebleeds, severe asthma and other respiratory problems. (Within 5 – 12 miles is the danger zone being studied.) 300 residents of a Texas fracking town filed formal complaints recently with the state authorities. It is too soon to trace the effect of exposure to birth defects and cancers, but newborn babies across the nation already show 200-300 chemical contaminants in the blood of their umbilical cords when tested, according to the National Academy of Pediatrics. Every well requires 400 – 2000 trucks running 24 hours a day carrying sand, frack fluid and water in, and oil, possibly gas, and “produced”, (which means poisoned), “water” out. 24 hours a day of tremendous noise, dirt, fires and lights all night, hundreds of transient workers and big machines pounding up and down roads without ceasing during the entire life of the well. Perhaps 30% of the water forced into the rock comes back up, but laden with chemicals in a thick soup of sand. Standard practice is to truck this elsewhere and re-inject it, which seems to be causing earthquakes. The other technique is to pump it into evaporation pits. When these pits and impoundments get breached, the contaminants have flowed directly into ponds and pastures. Half the cows grazing near one, in western Pennsylvania, gave birth to dead calves that year and the following year effects were very visible in an unusual lack of steers. This means that something like 70% of the potentially poisonous water remains in the permeable shale rock layer, trickling slowly down. The Floresta/Forest Service takes responsibility for the surface of the land. The studies they‘ve conducted on the impact of proposed oil fracking focus on the surface of the land. But, as devastating as oil extraction is to land, the catastrophic consequences are likely to happen slowly underground. Independent review is also needed and Rio Arriba Concerned Citizens is undertaking one. INCOMPLETE STUDY AND DISREGARD FOR PROCEDURE – the BLM needs to update the 2003 Resource Management Plan (RMP) and Mancos Shale/Gallup formation RMPA/EIS alternatives. These two studies do not address shallow shale hydraulic fracturing (fracking) in this geologic situation. If the lease sale continues BLM will be in violation of the National Environmental Policy Act (NEPA). WATER – anything you’d like to say about water; quality, availability, importance of clean water, etc. Millions of gallons of water are required for each proposed well and oil and gas companies will use our water. Fracking risks poisoning local water and that of millions of downstream users because the geologic layer containing oil and gas east of the Continental Divide sits above the aquifer. CHEMICALS – oil and gas companies are not legally required to disclose the chemicals they inject into the wells. In 2011 the House of Representatives reported that of 2,500 fracking products, 650 contain known carcinogens. Spills in New Mexico’s oil and gas fields set records in 2012, with nearly 700 self-reported accidents. At least thirty reported spills during 2011 and 2012 impacted a waterway or a groundwater supply. Toxic waste -water will be produced by the millions of gallons and there is no reference in the BLM Assessment to how they will dispose of it. EARTHQUAKES – the Abiquiu Reservoir and Heron Lake are placed near several known fault lines. Injection wells are often used to dispose of waste-water and are known to cause seismic activity. AIR QUALITY AND CLIMATE CHANGE – flaring is a common practice used in fracking in which huge amounts of hydrocarbons are released directly into the atmosphere. Flaring also poses an extreme fire danger in our Santa Fe National Forest. A 3- 12 miles radius has been identified as dangerous to human and animal health. Waste- water pits are another means of disposing of the toxic sludge. These are open pits that are filled with waste-water and left to evaporate. SOIL RESOURCES – in this high desert climate the soil can be fragile. Talk about your concerns for the soil in light of heavy traffic from big rigs used in fracking; erosion caused by roads and construction of drilling pads; toxic chemical spills and anything else you might have to say about the earth. WILDLIFE – talk about endangerment of any particular species – disruption of migratory patterns, etc. DARK SKY – talk about your feelings for an uninterrupted night sky view. CULTURAL RESOURCES AND LANDSCAPES – talk about what is dear to your heart in this area – what resources and landscapes you want to remain. A section of the Old Spanish Trail runs through these parcels. The BLM has also identified hundreds of multi-cultural historic sites in the area of these parcels that are listed in the Environmental Assessment. Environmental justice refers to the fair treatment and meaningful involvement of people of all races, cultures, and incomes with respect to the development, implementation, and enforcement of environmental laws, regulations, programs, and policies. It focuses on environmental hazards and human health to avoid disproportionately high and adverse human health of environmental effects on minority and low-income populations. Talk about your feelings in light of this statement and what you know about hydraulic fracturing as it relates to the Rio Arriba Frontier District. Write about what you think about that. DISRUPTS COMMUNITIES BY INCREASING NOISE POLLUTION AND TRAFFIC, OVERSTRESSES INFRASTRUCTURE – thousands of big rig trucks running on roads 24/7; generators, bright lights, hampered emergency response times, etc. IN CLOSING – round out your letter with a reiteration of your demand/request to defer the remaining 13 parcels in this Lease Sale. Use your own words. The BLM Farmington Field Office has the authority, as the sale agent, to defer these remaining parcels. These 13 parcels in the Santa Fe National Forest pose the same issues as their neighboring parcels that have been deferred and the same risks to the Rio Chama Watershed east of the Continental Divide. INCLUDE THIS SENTENCE: A finding of No Significant Impact (FONSI) for the October 22, 2014 Oil and Gas Lease Sale is not adequately supported by the Environmental Assessment as it now stands. My name is Felicity Garcia and I am writing to protest the proposed sales of parcels NM-201410-001, 004 thru 015 that will be offered up for lease in the BLM Competitive Oil and Gas Lease Sale, October 22, 2014. I am a lifetime resident of Gallina, and my family has farmed and raised livestock in this area for hundreds of years. My income is based on the integrity and productivity of the land. I understand the importance of clean water, and a functioning ecosystem for the health of our community. Without clean water we cannot hope to thrive in our traditional lands. We live with a limited amount of water in our part of the world, and I am concerned about the 2-10 million gallons of water that is used for each well in this process. I highly protest this misuse of the limited resource of water. Chemicals used in hydraulic fracturing are known to cause cancer, neurological, and other health problems. There have been many examples of spills and groundwater contamination, despite the efforts of private oil and gas companies. The risk of polluting our precious water is too great. If our water is affected it is the residents who will have to live with the consequences, not these companies. The waters in Gallina and Regina flow into the Rio Chama and any pollution will also affect our neighbors down river all throughout the state. Our forests are vulnerable to forest fires because of extreme drought, and the hydraulic fracturing process involves many fire risks. Wells have exploded and caught fire, and the flaring of natural gas burn off can cause the dry forest to catch fire. Our forests are a part of our livelihoods and heritage as we use them for firewood, livestock forage, and wildlife habitats as we have for hundreds of years. After a fire burns the exposed soil can cause flooding that and also pollutes our rivers. I again protest and ask you to defer the 13 parcels up for lease in the October 22, 2014 BLM Lease Sale. Please send your mandatory response to.